Let the Las Vegas Monorail show you the best way to travel on the Strip. The trains provide fun, quick and convenient Vegas transportation to and from hotels, the convention center, and casinos. With trains arriving every 4-9 minutes at our seven stations along Las Vegas Boulevard, you can ride knowing you are using the fastest, cleanest, and most efficient Las Vegas public transportation system available. Visitors and locals who travel the Las Vegas Strip have one more reason to ride the Las Vegas Monorail that will save them time and money. For as little as the cost of a single-ride ticket, Monorail riders can now experience more dining, shopping, gambling and entertainment venues both on and off the Las Vegas Strip. Let the Las Vegas Monorail transport you to all the excitement on the Las Vegas Strip. Enjoy delicious world class dining, spectacular entertainment, the hottest nightlife and unique attractions, the Las Vegas Monorail can show you around town in about 15 minutes. Start exploring and see where the Las Vegas Monorail can take you. 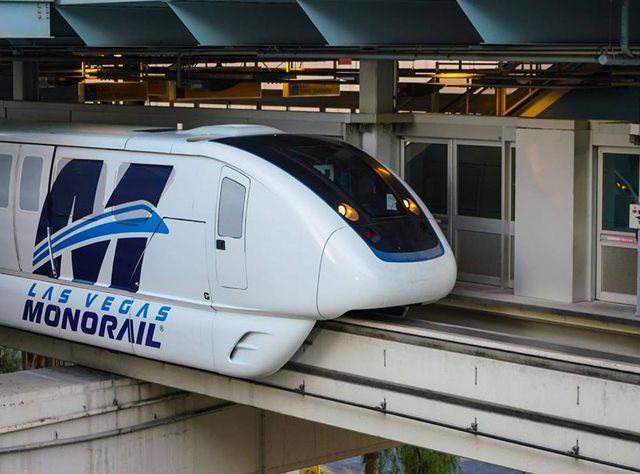 The Las Vegas Monorail operates: Mondays 7:00am to midnight, Tuesday – Thursday 7am to 2am, and Friday – Sunday 7am to 3am. Admission is available in 1, 2, 3, 4, 5, and 7 day passes. Children 5 and younger ride for free with an adult. Vouchers must be redeemed at the Monorail ticket booths between 10am - 6pm. Please note: Monorail tickets are NON-REFUNDABLE. All sales are final.